Now I suppose, I should justify that statement. I hate to use that tired old cliché, but I hate what Christmas has become. When I was a child, Christmas was at the end of December, and it lasted, at the most three days – Christmas Eve, Christmas Day and Boxing Day. That was it! Santa had his Grotto in the main department stores, but not before the 1st of December and most people did not put up their decorations until around the 20th December. Some of the local shops did their decorations a bit earlier, but I don’t really remember them doing much. Of course, there was not the mass media hype that we have now. Television did not have the power it now has, so Christmas advertising was mainly driven by what we would call small, posters. Now we have Christmas from around the beginning of October, with all the pressures that it brings. It is a similar thing with bonfire night. It used to be Mischief Night on the 4th of November, when we would go around knocking on peoples doors or pinching wood from other bonfires. Sometime, the older ones would let off ‘bangers’ and then run away. Then there was bonfire night itself. The only night when fireworks could be legally set off. Now it starts at the end of October and mixes with Halloween (I refuse to call is ‘Trick or Treat’), then goes of until the weekend after bonfire night. It’s turned into ‘bonfire weekend’. But I digress. This rant is a Christmas rant. this is also the time of year, when charities feel obliged to try and wring more money out of us, by mentioning ‘Christmas Spirit’. I don’t have a problem with giving to charity and regularly do so. My problem is that you get inundated with them, and you cannot give to them all. That does not include the professional charity collectors. Chuggers, they are called. They are the ones that stop you in the high street, carrying their obligatory clipboard, to sign you up to give only £2.00 a week. With their usual mantra of ‘….it can do so much….’ they attempt to make you feel as guilty as possible so as to convince you that £5.00 will do so much more! Now, we are in the midst of the worst austerity measures in British history, with Local Authorities being forced to strip millions from their budgets. Yet they are still expected to spend many thousands of pounds on Christmas Illuminations and the ‘C’ lest celebrities to switch them on. To cap it all, when it’s all over, it will be only four months to Easter! Well the reports got done. I tried doing the ‘fiddly bits’, but I did not know what ‘She Who Must Be Obeyed’ actually wanted me to do. Juggling the spreadsheet about, using financial controls is not my kind of thing. So after consulting the boss, I left the job ‘unmolested’. Anyway, neither of the people for whom the report was for, was in this morning. So not really my fault. I got a couple of Spike’s reports done too. That shut him up. I don’t think he expected me to have them done. I’ll get the permit one done first thing tomorrow. I did learn how to create ‘Dynamic Ranges’ in Excel and how to create a User Defined Function, so not a wasted day then. I’m getting really pissed off with that person I mentioned in an earlier post. I don’t know if they are getting worse, or if I’m just picking things up that I would normally not bother about. It was funny to watch her going though R***’s desk this morning, looking for things she can take when he leaves. Could wait until the guy’s gone at least. Big man has got the Auto to do next week. He seems confident and he should be okay. I’ll make sure the Reg 10 copies are in plenty supply. He’ll have to make sure that only valid ones go. I reckon there could be a lot that get binned. It’s dress down tomorrow. I really don’t know if I can be bothered with it. I am not comfortable wearing jeans and things at work. There is not that work/home separation when you don’t get changed at then end of the day. Holidays next week. Sunny Blackpool here we come. 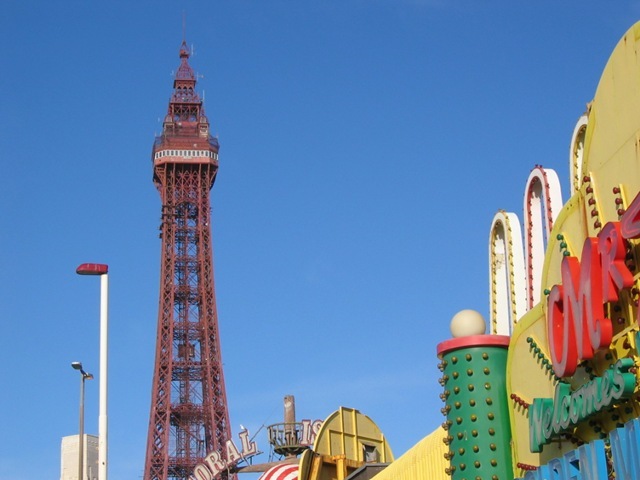 It is strange to think that Blackpool is one of the most deprived towns in England. Where does all the tourist cash go ? Everything seems to be a little more expensive there than here, and the place will be heaving over the Easter Weekend. Saying that, when you look at some of the shops away from the promenade, it is very depressing. It will be a strange feeling, without the eldest. We have been away without him once before, but not for a full week. He should be fine if he does not have any ‘emotional crisis’s’. We just hope everything will be okay, and that he will be sensible and mature. Fingers crossed then.